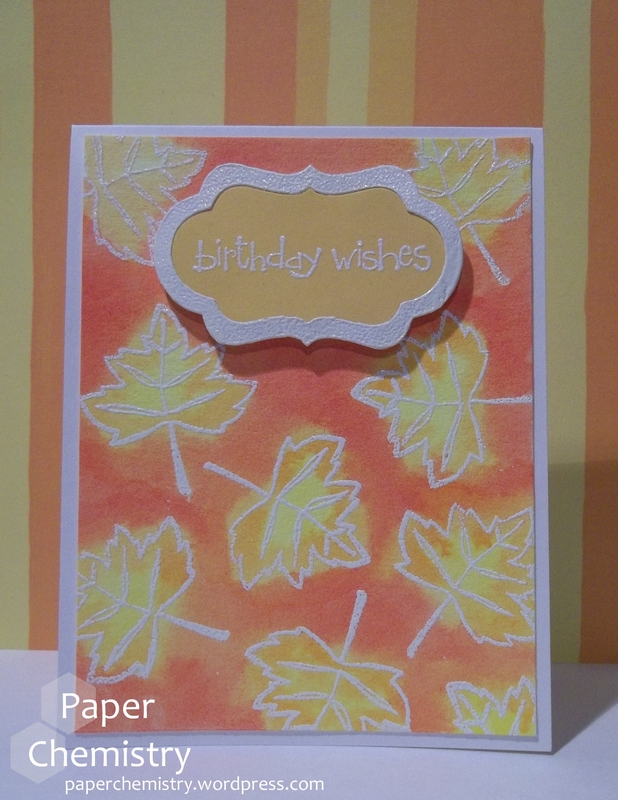 Here’s the third of the three October birthday cards! Thanks for hanging on for the ride! This fun card went to my Partner-in-Crafting-Crime in Oklahoma. I enjoyed trying something with watercolors. I stamped the leaves on watercolor paper and embossed them with white embossing powder, and then painted the watercolors over the top. I currently have just a set of Crayola watercolors and am wondering if I need something better to get darker colors. This card looks fairly dark, but you’ll see the lack of depth to the color in tomorrow’s Halloween card post. The sentiment is the same as the previous two days, and the framelits for the sentiment are by Sizzix. The stamp also came from my fall Inkadinkado set. I definitely got mileage out of this set this October birthday season! Thanks for sticking around for all three parts of this series!